Satisfying backpacking food: an elusive quest every hiker knows a little something about. Ever wake up at midnight in your sleeping bag and re-live every bite of dinner? Or can't fall asleep because you're hungry? Realistically, there's only so much you can do to achieve a full stomach on a hiking trip. Part of it is preparation. Let's geek out on brain biochemistry, to be exact. You might think it's a full stomach you're after, when in fact, it's a way to satisfy your bossy brain. Brain cells need a steady (some would say relentless) supply of fuel molecules in order to keep performing their important work. and a lot more you never think about. So you have to fool your brain into thinking you ate more than you actually did with the limited rations in your backpack. Yes! But it takes some planning and knowledge. If you had to sit down and eat until your stomach was completely full, you couldn't do it. You have a built in warning system in your brain that says "that's enough, go do something else for awhile". Backpackers call it a curse. Because it's tough to consume enough calorie dense mouthfuls to trigger that satiety message, when you're carrying everything on your back. So you're going to have to get sneaky about provoking a satiety signal between gut and brain. And believe it or not, there's a Satiety Index you can use to do that. Use that link for all the geeky details. Let's just cut to the chase here. These have an additional benefit to you: lots of soluble and insoluble fiber, which has been noted to fill you up even when not high in calories. If you rehydrate these foods with generous portions of water, you'll also get a lot of volume out of them. Your stomach registers their presence, and fires off a "good enough" message to your brain. 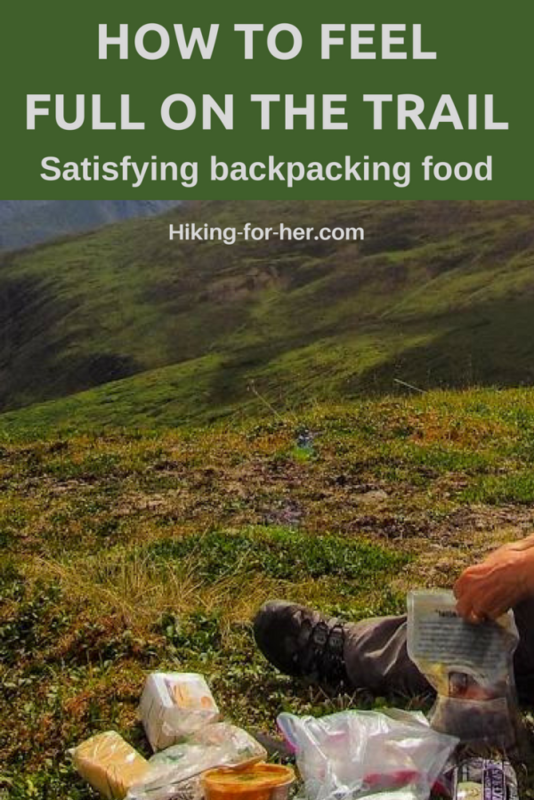 So if you can carry enough of those backpacking foods, and manage to get enough of it into your stomach at any one time, you'll feel full enough to also feel satisfied. The same scientists who gave us the index also gave us another clue to how to feel full after a backpacking meal: palatability. Enter your clever brain again, and with just one word: fats. There's a simple logic to it, because foods high in fats contain more calories AND taste really good, so you tend to think of them as palatable. As any ravenous backpacker knows, really, really palatable. This means pack a lot of nuts, nut butters, cheese, trail mix containing chocolate chunks, in addition to the food already mentioned above. Select the best brain boosting backpacking nuts with these tips. Highly palatable food items weigh more, and cost more, than cheap candy bars and pop tarts. satisfaction after a meal, in other words. High protein foods keep you feeling full longer. If you're eating small amounts of protein at supper time, you will probably wake up in the middle of the night with screaming hunger pangs. To stay asleep, be sure you get enough protein with your evening meal. Another trick you can use to trigger that "full" feeling, if you don't mind getting up during the night, is to ingest a few mugs of water along with dinner. The high volume in your stomach will send a satiety signal to the brain, at least long enough for you to fall asleep. Hot, salty soup broth is a personal favorite for getting additional water into my body without killing my appetite for fluids. Do you sometimes crave baked potatoes, and big slabs of heavy breads with butter during a multi day backpacking trip? Or a huge bowl of guacamole with salty chips? These foods rank high on the satiety and palatability scales. But they're impossible to lug around in your backpack. So if at all possible, bring along some butter or guacomole for your first night out, or a big hunk of aged cheese that can be added to dinners for several nights before turning rancid. Bring a small amount of high quality olive oil, and add it to breakfast and dinner hot entrées. When your body is sending clear signals for fats, salt, protein, now you know how to game the system in your favor on a backpacking trip. Tip: Keep a food journal on your next backpacking trip for just this reason. Record quantities and types of food consumed, cravings and even your dreams! It's all feedback for planning a more satisfying backpacking menu for next time out. Satisfying backpacking food is way more than just your favorite flavor of instant oatmeal! Get deliberate about your food choices, and watch your mood, stamina and attitude improve. For more trustworthy and specific tips on hiking food and nutrition, try these Hiking For Her Fast Facts booklets.